Prominent & Leading Manufacturer from Ahmedabad, we offer 900 ml plastic locked airtight rectangular container, 170 ml plastic locked airtight rectangular container and 3000 ml plastic locked airtight rectangular container. 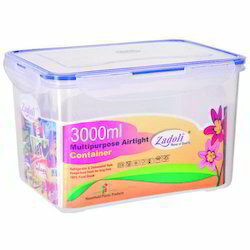 Our company is manufacturing & supplying a wide range of 900 ml Plastic Locked Airtight Rectangular Container. Fabricated using high grade raw material these are known for optimum quality, high storage capacity and excellent material strength. The containers are primarily use to store paints. Moreover, these are available at leading market prices. Looking for Plastic Locked Airtight Rectangular Container ?